Now that we’ve entered the month of February, I of course am going to give a few recipes for the holiday that either people avoid like the plague or fully embrace: Valentine’s Day. I guess I fall somewhere in between these two categories in that I don’t hate the holiday, but I don’t expect my boyfriend to make reservations at a fancy restaurant or give me an extravagant gift like a diamond necklace. I DO however enjoy the two of us making a big dinner, cocktail in hand, while wearing our pajamas. That to me is so much more romantic and fun than sitting next to strangers at a busy restaurant. One other aspect that I enjoy doing for Alex on V-Day is baking him something decadent for dessert and/or starting the day for him with an amazing breakfast. On most days, breakfast at home is pretty boring and consists of peanut butter toast and greek yogurt. But on Valentine’s Day, I kick it up a notch (I’m Emeril now) and sometimes make Alex pancakes and bacon or an egg scramble filled with whatever veggies I have on hand in the fridge. To say that Alex loves this is an understatement; he appreciates this small gesture so much and I know it makes his day. So I think waking up a little earlier and whipping up a more exciting breakfast for your significant other is about the nicest thing one can do at 7:30 in the morning. Not sure on what to make for your SO for the love-filled holiday? Let me make the tough decision for you and tell you that you NEED to make these lemon poppy seed buttermilk waffles! And while we’re at it, let’s have you make a homemade blueberry maple syrup (with no added sugar!) to drown those waffles in. Waffles for breakfast is not only delicious and much more exciting than cereal, but actually comes together fairly quickly and will certainly impress whoever you make them for. Ever since I received a waffle maker this past Christmas, I have been making a new batch of waffles every single weekend (literally) for Alex and myself. I luckily found a recipe that I absolutely love and not only tastes incredible fresh from the maker, but freezes exceptionally well - all you have to do is pop them in the toaster, press the defrost button, and they’ll have the same texture and taste as the day you made them. So, I decided to take that recipe and put my own spin on it by using the classic flavor combo of lemon and poppy seed. 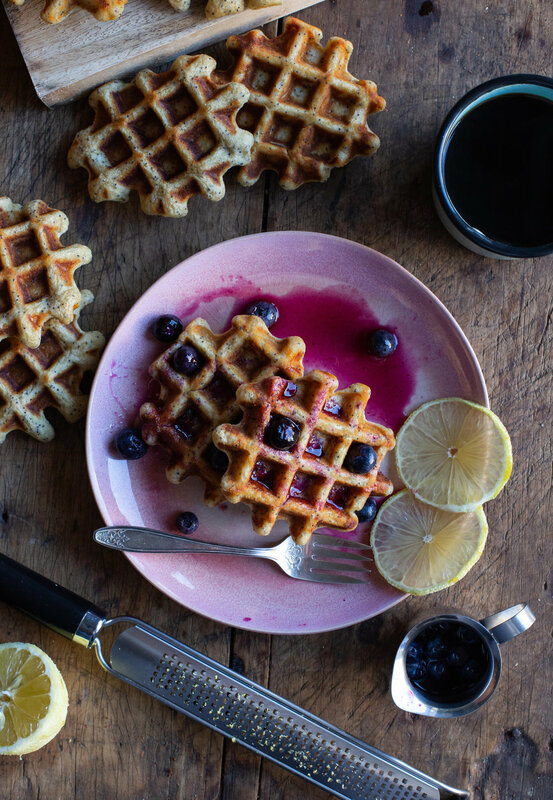 We’re currently in the midst of citrus season and so the addition of bright and flavorful lemon zest and juice really brightens up the waffles and gives it such a fresh taste. As for how many waffles this recipe will yield you, it really all depends on what kind of maker you own. I personally have this one (I love it btw), and with scooping out about 1/3 cup portions, I get 12-14 waffles. If you have the round waffle maker, I would suggest following the manufacturer’s directions on how much batter to use per waffle. And let’s not forget the blueberry maple syrup! My favorite toppings for when I eat waffles have always been maple syrup and blueberries, so I decided to combine the two to make life a bit easier. Three ingredients + a stovetop + less than 10 minutes of your time = an elevated take on the kind of syrup you find on the table at IHOP. The finished result is a bit more liquid-y than normal maple syrup, but this won’t bother you the moment you take your first bite. And regardless, there are whole blueberries added to the syrup at the end so you’ll get the best of both worlds. Do me (and your SO) a favor and make these waffles for Valentine’s Day! And if for some weird reason breakfast isn’t your thing, I’ll be posting a Valentine’s Day-friendly dessert next week. In a medium saucepan, combine 1 1/2 cups of the blueberries with the maple syrup and lemon juice. Heat over medium temperature for about three minutes, or until the berries have softened a bit. Using the back of a wooden spoon, crush the berries against the side of the saucepan. Do this carefully, because the berry juice will be very hot. After a few more minutes, the mixture will begin to simmer and foam, and that is when it’s done. Pour the mixture through a strainer placed over a medium sized bowl and discard the blueberry solids left behind. Stir in the remaining 1 cup of blueberries and allow to cool a bit before enjoying. Transfer leftover maple syrup to a glass container, like a mason jar, and refrigerate. In a medium size bowl, using your hands or a whisk, massage/mix the granulated sugar and lemon zest together until fragrant (this helps release the oils in the zest). Add the flour, poppy seeds, baking powder, baking soda and salt. Whisk together. In a large bowl, add the buttermilk, fresh lemon juice, vanilla extract and eggs, and whisk until incorporated. Slowly add the melted butter while continuing to whisk, so as not to curdle the cold buttermilk. Add the wet ingredients to the dry ingredients, and mix until just combined. Do not over mix! Allow the batter to sit at room temperature for 10-15 minutes. Preheat your waffle maker and spray with cooking spray. Add about 1/3 cup of batter for each waffle, but do whatever size works best for you in your personal waffle maker. Cook until the waffles are golden brown, about 4 minutes. Repeat until all batter is used up. Enjoy your waffles with blueberry maple syrup, a pat of butter, and/or a sprinkling of confectioners’ sugar. Waffles freeze extremely well: just pop the frozen waffles in your toaster, hit the defrost button, and they’ll taste exactly the same as on the day you made them.